Vivian closes her eyes, and quickly falls into a light trance. The first feeling I always get is that I am cold, very cold. So very cold. I feel cold all the time. And I am high up on some huge mountain. But strangely enough I´m also underground. The two sensations…co-exist, somehow. I don´t understand. And then, I hear strange voices, speaking in an unknown language. Then I get the image of a…a…fire ? No, wait, it´s a bird…A bird on fire? What could that mean? Then I hear chanting. I hear very very deep voices, in a weird rhythm. Ta-ta-tatata-ta-ta…The feeling is so…gloomy. Then I see a blue sky that turns inky black in an instant. Vivian´s voice trails off. She seems asleep. Master Blaise nudges her a bit with his voice. “Home”? What is “Home”? Can you draw it in the air for me ? says Blaise, careful not to wake her. Vivian draws a sign in the air. Blaise looks at Corwin and nods. It is as I thought, that is a “Lambda”, he whispers. Now what do you see, my dear? I hear a dragon roar. A huge red dragon. I can hear a voice that says…”The Conquerors, the Conquerors are coming!…” And then I see…flying needles? What ? What happened? Corwin exclaims. It is too weird. I cannot go on. Well then, says Blaise. Come back to us. Look at the fire. Breathe deep. And what about the purple flames, asks Master Blaise. Vivian sighs. I don´t know what they are. They are like flowers all over a screen. I can see the screen, a big dark one. On the screen, I see a map of …of…Elvenland! And lots and lots of little violet flames, as if the screen was on fire with…flowers? Vivian is fully back now, sitting upright in her chair, in Blaise´s private room. How do you feel, my dear? asks Corwin, obviously concerned. I feel good enough, Vivian smiles. It is just so…so…weird. Weird in what way, Blaise aks. Weird, as if I was seeing…not my reality, but also my reality. Blaise goes up to the library that covers one wall. He picks up a big book, bound in dark leather. I will show you something now, and you must tell me how you feel about it, he says. He opens the book and shows a picture to Vivian. Vivian looks at the picture. Tears spring to her eyes. Vivian? says Corwin. Are you all right? Yes? Blaise looks at her in an oddly intense way. I feel the same as that picture, as if I was a…a prisoner. Under…under a mountain…? Blaise smiles. He closes the book and puts it back on its shelf. It is as I thought. It is high time, my dear, that I should tell you about the Legend of the Watcher on the Roof of the World. Hmmm…very strange. 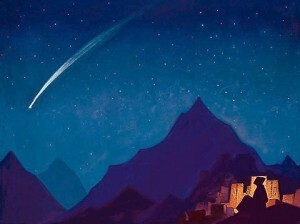 But I am looking forward to the Legend of the Watcher on the Roof of the World!!! Agree with Jill, lol!!! Superb.